If your interest in psychology is in the biological basis of behaviour, this could be the program for you. You'll study a range of topics, including advanced research methods in the behavioural sciences, sensation and perception; animal learning and cognition; hormones and behaviour; computers and psychology; and biopsychology. The BSc in Behavioural Neuroscience program is intended for students whose interest in psychology is in the biological basis of behaviour. The program covers a range of topics including advanced research methods in the behavioural sciences, sensation and perception; animal learning and cognition; hormones and behaviour; computers and psychology; and biopsychology. Concepts fundamental to biological issues, such as the genetic basis of biological variation, evolution, infectious diseases, causes of cancer, population growth, and human effects on ecosystems. Not open to students who have credit for Biology 12 (including AP, IB). Principles of storage and transmission of genetic variation; origin and evolution of species and their ecological interactions. Fundamentals of bonding theories, structural chemistry and equilibrium with applications relevant to modern society. Derivatives of elementary functions. Applications and modeling: graphing, optimization. Consult the Faculty of Science Credit Exclusion List: www.students.ubc.ca/calendar/index.cfm?tree=12,215,410,414. Fluids, harmonic oscillator, travelling waves, standing waves, sound, and interference of light waves, including diffraction. Detailed introduction to experimental and theoretical aspects of motivation, sensation, perception and learning. Reactions and properties of carbonyl compounds, carbohydrates, amino acids, nucleic acids. The relationship between the nervous system and behaviour; the physiological basis of perception, motivation, learning, and memory. Detailed coverage of basic research methods; the design of experiments and statistical analysis; methods will be applied in laboratory and project work. 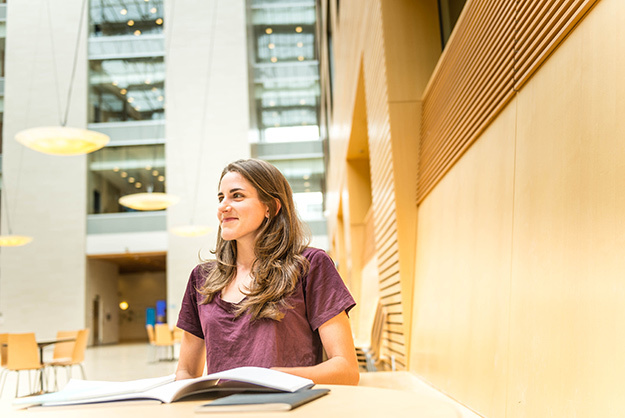 Before arriving at UBC, Katherine had already been cultivating an interest in neuroscience through work in an Alzheimer’s research lab. She was able to match and nurture that curiosity further by majoring in Behavioural Neuroscience.